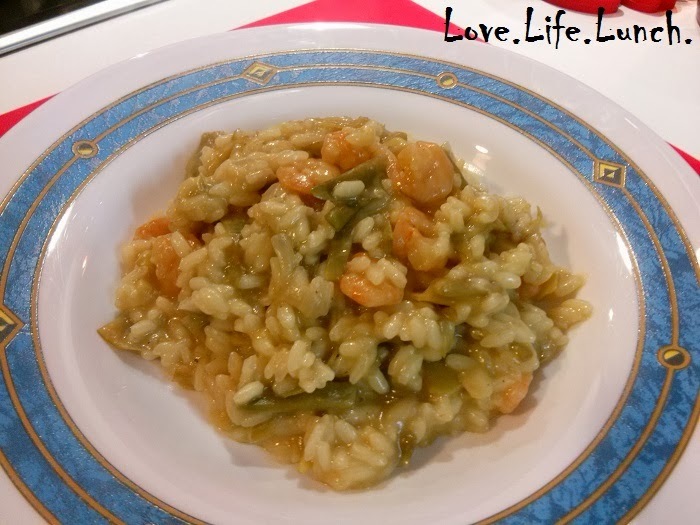 Risotto carciofi e gamberetti • Love.Life.Lunch. Inauguriamo la stagione dei carciofi con una ricettina pratica da realizzare e buona da mangiare: risotto carciofi e gamberetti. Il carciofo è una pianta della famiglia delle Asteraceae coltivata in Italia e in altri Paesi per uso alimentare e, secondariamente, anche per uso medicinale. Esistono diverse varietà di carciofi ma tutte sono legate da un unico denominatore: i carciofi fanno bene alla salute del nostro organismo. Sono depurativi (dedicherò un post alle proprietà dell'infuso di carciofo), contengono molti minerali e sono ottimi alleati contro i disturbi legati al fegato. Pulire i carciofi togliendo i gambi e le foglie esterne più dure, mettere la parte interna più tenera in una ciotola con acqua fredda e il succo di limone. Tagliare finemente lo scalogno e farlo imbiondire in una pentola abbastanza alta con l'olio EVO, tagliare quindi i carciofi a listarelle eliminando la barba interna e aggiungerli allo scalogno. Lasciare insaporire i carciofi per qualche minuto prima di aggiungere il riso. Tostare bene il riso e sfumarlo con 1/2 bicchiere di vino bianco. Quendo il vino sarà evaporato completamente ricoprire con del brodo vegetale bollente. Proseguire la cottura del riso aggiungendo un mestolo di brodo ogni volta che il precedente è stato assorbito. Aggiustare di sale e pepe. ﻿Se come me utilizzate i gamberetti surgelati basta unirne una manciata qualche minuto prima della fine della cottura, mantecare poi con una noce di burro e servire ben caldo.Se invece avete a disposizione gamberi freschi è bene scottarli in padella con poco olio per un paio minuti aggiustando di sale e pepe prima di servirli come accompagnamento al risotto adagiandoli nel piatto 4 per ogni commensale. Let’s introduce the artichoke’s season with a recipe handy to realize and so good to eat. The artichoke is a plant from the Asteraceae family farmed in Italy and in other countries for food, but also for pharmaceutical purposes. There are different types of artichokes all with a common denominator: they are good for your health, they are depurative, they contain a lot of minerals and they are great ally for treating liver disorders. A classic match is artichokes and prawns, delicate but tasty. 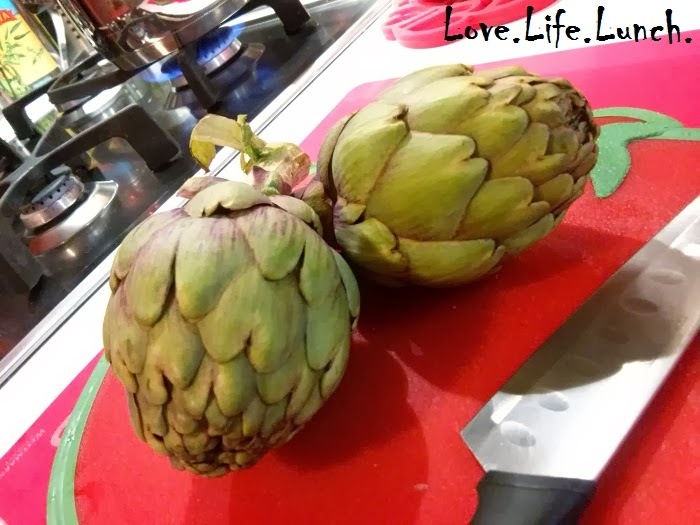 Slice off the top 2cm of the artichoke’s top, then peel the stem with a knife or speed peeler. Tear off the tough outer leaves until you get to the softer inner green ones. Open them out, then use a teaspoon to scrape out the furry chokes and discard. If you’re doing this ahead, put the artichokes in a bowl of water with a little bit of lemon juice to stop them discolouring. Slice finely the shallot and put it in pan with extra virgin olive oil until browned. Then add the artichokes. Let them develop a richer flavor before adding the rice. Add the rice to the pan and turn up the heat. Cook for a minute or so, stirring constantly until the rice looks slightly translucent. Add the wine and keep stirring. Any alcohol flavor will evaporate. Once the wine has been absorbed by the rice, add your first ladle of hot stock, turn the heat down to a simmer so the rice does not cook too fast. Add the stock, a ladleful at a time, stirring constantly and allowing each ladleful to be absorbed before adding the next, until the rice is cooked but still hold its shape ( about 15 minutes). Add salt and pepper, if needed. Few minutes before the end, add prawns. If you use the fresh prawns, you need to lightly cook them in a pan with a little bit of extra virgin olive oil and seasoned them. When the risotto is ready, remove the pan from the heat and add butter. Serve until it is still hot and add on top 4 prawns for each plate.